They say everything is bigger in Texas. Not sure who "they" are but that is what I hear. As a British expat living in Dallas, TX I am not too sure about the truth of that. I have lived many places and for the most part they all seem very much alike. However, it does seem that Texan's have a propensity for the "strange". There are a number of decidedly strange and unique houses in Texas and this is a tour of five of the best. It would be a somewhat extreme "road trip"; feeding the locations into Google Maps generates a trip of some 1163 miles over 20 hours and 27 minutes if you start and end in Dallas, TX. With stops it would obviously be considerably longer. The route and locations can be found here. I for one will not be undertaking the trip; if anyone out there is adventurous enough feel free. However I will be taking the opportunity to visit these locations should I ever be close by one of them and perhaps you might like to do the same. 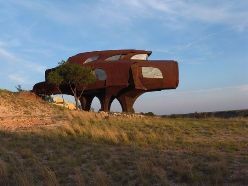 Located around 85 East Canyon View Drive, Ransom Canyon, TX [the address is approximate] 15 miles or so East of Lubbock, TX the "Steel" House was the creation of "Architectural sculptor and artist" Robert Bruno. The property was constructed over an extended period of some 35 years starting in 1973. Bruno undertook the construction himself; no construction workers, no tradesmen, just year after year of determination and persistence. The building is crafted mainly in metal but Bruno added other materials, most notably stained glass. In a way the home grew, under the ever present watchful eye of its creator, rather than "was built". The design was a fluid concept; unlike most construction projects which have a distinct design phase and then a building phase where the "fixed" design is brought to life the "Metal House" as it is sometimes known locally was in design for all of its 35 years of construction. For more information the book "Weird Texas" by Wesley Treat, Heather Shades and Rob Riggs contains a section on Robert Bruno's creation. You can find the excerpt by searching on Google Books. In addition a search on YouTube will yield a video of Robert Bruno himself talking about and showcasing his creation. I enjoy a beer as much as the next guy though in more recent years I tend to imbibe less frequently than I once did. 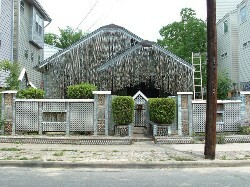 I cannot even begin to imagine consuming over 50,000 cans of beer even with the help of everyone I know but that is precisely what Houston resident John Milkovisch did during the course of the transition of his home at 222 Malone St, Houston, TX from standard single family home to "Beer Can" House. Said to have "got sick of mowing the grass" Milkovisch started small in 1968 using marbles, rocks and pieces of metal to create landscaping features for his yard. His project expanded from the yard to the house once the yard was covered and continued until Milkovisch passed in 1988. He certainly did and the home was the recipient of a $400,000 restoration project in 2008 that was even reported in the mighty New York Times. The home is now owned by the Orange Show Center for Visionary Art and is open for tours. A Google search for the Center will yield information on charges and hours of operation. Ok, this one is a little bit of a cheat. 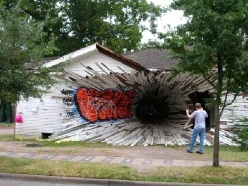 It was in Texas but only for a short while before it was demolished. It was located at 1953 Montrose Boulevard, Houston, TX 77006. "Havel and Ruck will create a large funnel-like vortex beginning from the west wall adjacent to Montrose Blvd. The exterior skin of the houses will be peeled off and used to create the narrowing spiral as it progresses eastward through the small central hallway connecting the two buildings and exiting through a small hole into an adjacent courtyard." Unfortunately this oddity will have to live on in images only. Located on S Munson Rd, Royse City, TX 75189 the "UFO" house looks more like something a space traveler might see on a planet in Alpha Centauri should the human race ever master travel to the stars. 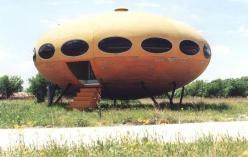 In fact the property is one of the estimated 30 to 50 surviving Futuro homes. Produced in the late 1960's and early 1970's the Futuro home was the brainchild of Finnish architect Suuronen and, contrary to the original idea of a ski-cabin, it turned out to be a prefabricated and easy to transport home which could be mass produced and transported anywhere. A Futuro home could be assembled / disassembled on site in a couple of days or it could even be transported pre-assembled by air. Unfortunately the main material used in construction was plastic and the three fold increase in the price of oil in the 70's crisis resulted in the end of production as the business model lost its financial viability. Futuro homes exist to this day in many locations including Texas, Florida and even one that is available as holiday rental in Wisconsin. A Google search will yield many hits on the Futuro home. 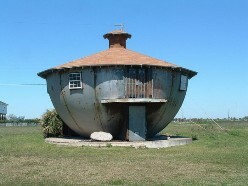 Located on the Gulf Coast of Texas at 1410 Mirimar Drive, Galveston, Texas [address is approximate] the "Kettle" house as it is known would seem to be an ideal construction for the hurricane prone area; a large and presumably very heavy lump of metal, while not impervious to the wrath of nature, probably has a better chance than most. "Supposedly it was erected by a gentleman who used to build storage tanks for oil companies, though his exact identity is unknown. The neighbors, some of whom were residents when the "Kettle" went up, have seen the man but know little about him." So there you have it; five of the quirkiest, strangest and interesting residential properties in Texas. If you are ever in the vicinity of any of them definitely worth a visit or if you are the incredibly adventurous and have way too much time on your hands you could always look up my "road trip". Great article SimonRobson and good to see you over at the Block.Thumbs up from me! Appreciate the feedback - have a good one. What a great article. Amusing and of interest for the un-ordinary. I found it on the Block.